The Shelby A/C Cobra is a very influential car. People have paid homage to the V-8 powered roadster in many different ways. And some mysterious soul decided to make a Cobra out of a large hunk of wood. 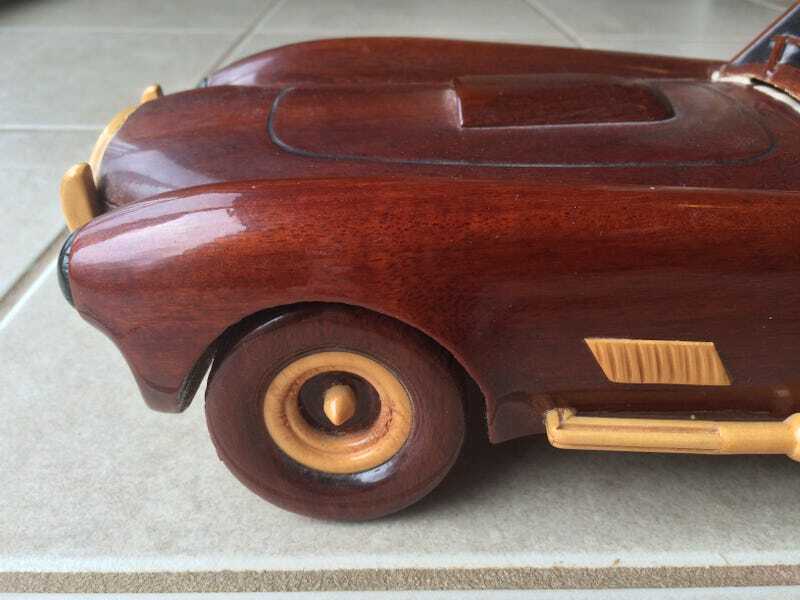 Before you is a wooden replica of a Shelby Cobra that is of completely unknown origin. My parents saw it at an auction for cheap and decided to pick it up for me as a present. I had no idea what to think, other than the fact that it is huge. To give you an idea of how large it is, here are some pictures with other models for scale. From left to right is a 1:64 diecast, a 1:18 diecast, and a 1:8-ish hunk of what I guess is mahogany. You may recognize the Ertl 1:18, it was the very first car I posted on LaLD. Build quality is hard to judge. I’m guessing it was done by a single woodworker, and I can’t imagine how hard it would be to replicate. It doesn’t sit perfectly flat, but maybe it did when it was first built. Wood warps and changes over time after all. Whoever made it did a good job of trying to get all the core details of the car, like the bumpers, tail lights, tag holder, gas cap and roll bar. The interior is somewhat detailed, all the basics are there. Note that the windshield is very fragile, I have had to re-glue it several times. The hood and trunk do not open, but the doors do! The passenger side door is very tight though, probably from the wood warping over time. The model is not solid, if you look through the snout you can see daylight. Still a heavy object though. How it was made I don’t know, but it is fun to look at. Hope you enjoyed this Live and Let Hunk of Wood review. Have a happy April Fool’s Day!